IMAGES: Greg Pond & Jesse Cahn Thompson, Flat Earth Folded, 2015. Pull into the parking lot at Canopy in Austin’s Eastside, park on the far end of the lot, exit your vehicle, and you’ll hear a phantom ringing in the air. You’ve already entered Greg Pond and Jesse Cahn Thompson’s exhibition Flat Earth Folded at Big Medium, on view through April 18. As the viewer approaches the gallery, that faint ringing grows louder and more complex, moving from a barely- perceptible high note, to the clear ringing of a wine goblet, and then to something akin to a Tibetan singing bowl, or a glass harmonica. It’s hard to pinpoint the source of that sound as the listener stands directly in front of the gallery, as if the tones are emitted from the glass face of Big Medium itself over a wide field rather than from a single output — which is by design. Inside, sound becomes more layered; lower tones enter into the composition, and the sounds are emitted not from one plane, but many. The sound becomes overpowering — not because of its volume, but because of its mix of consonance and dissonance, burdened chords and bellicose drones; the sonic equivalent of a muddy painting full of mixed colors and vibrancies, which leave no room for visual (or aural) respite. While that may be an appropriate analogy for the experience of SxSW, which early audiences experienced in tandem with the show’s opening, it’s a stretch to say it is the intent of the exhibition. Flat Earth Folded requires a suspension of disbelief in order to access the conceptual goals enumerated in the artists’ written statement. After reading that statement, and experiencing the show, it seems the intention doesn’t line up with the execution. That intended exhibition would have relied largely on the perception of sound, and how sound describes and interacts with the space and materials it encounters. 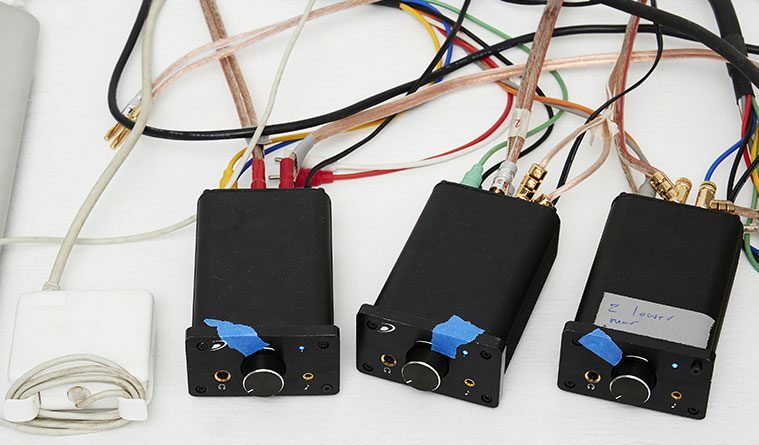 Through the combination of traditional directional speakers and lesser-known surface transducers (sonic gizmos that turn any rigid surface into a wide field resonance speaker), it seems Pond and Thompson aimed to create an environment in which different projections and shapes of sound would interact to form unique location-specific experiences; move through the gallery, and one’s sonic perspective would noticeably shift. It all sounds (pardon the pun) like an engaging and thought- provoking exhibition, but those sensations are not readily apparent, or at least not any more apparent than they are in any everyday environment with everyday sounds. In fact, the intended sensations may not be perceived at all without reading the statement, which leaves the listeners in the precarious position of wondering whether they actually hear a difference from one place to the next (whether they are gathering spatial and material information from the shifting tones and volumes), or whether it’s just the placebo effect — hearing a difference only because it is labeled as such. The sonic experience of the exhibition as a result, at least withinthe walls of the gallery, is tenuous. Without the intended experience taking center stage, one is left with a void. 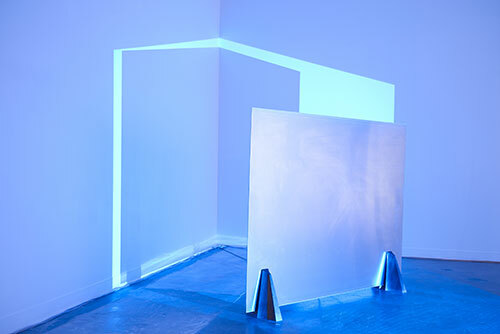 Two sculptures could potentially fill that gap, though these are fairly minimal types more aptly suited to supporting roles: Reflective metal sheets fitted with transducers, placed perpendicular to the floor, supported by footings on each end, and shot with a solid blue projection (the audio is very similar to that emitted by the glass windows). The only other work in the show is a semi-abstract filtered video projection of crisp white and bright blue that dips in and out of being recognizable. 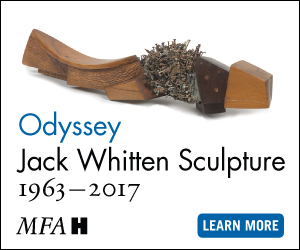 It’s visually interesting, and gives some texture to the environment, but that is not enough to make it the focal point of the exhibition. Instead, what fills the void left by a lack of clear sonic differentiation is the novelty of the transducer as a device. Unfortunately, the artist’s use of transducers isn’t that revolutionary, or even inventive; it’s exactly what transducers are designed and marketed to do. Had the exhibition achieved its goals, an imaginative use of transducers, or lack thereof, would not be worth mentioning, but because their earnest attempts fall short, one is left to find the next-most-interesting element of the show, leaving the exhibition-goer caught between straining to hear the profundity expressed in the artists’ statement, or reducing the thrust of the show to a technological demonstration. Still, with the healthy imagination that most exhibition-goers have, and with the strong prelude provided by the single-channel experience of approaching the gallery from a distance, the artists can rest easy that their conceptual aims are still hitting their mark. Those concepts may just be conveyed in a hypothetical, rather than an experienced reality.